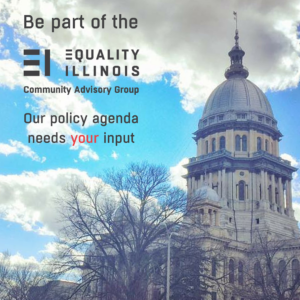 As part of our commitment to an ongoing dialogue with stakeholders across Illinois, Equality Illinois launched the Community Advisory Group in 2016. The group is a diverse cross-section of voices from across Illinois that informs the policy positions and initiatives we adopt and pursue in our work to secure and defend the equal and inclusive rights of LGBTQ Illinoisans. If you’re interested, go to the application page to review the objectives and responsibilities of the Community Advisory Group, then download, complete, and return the form. We want to make sure the Community Advisory Group includes the diverse views of LGBTQ Illinoisans from every corner of the state. Together, we will advance justice and equality in Illinois.